The backstory of these two very rare privately printed French posters is extraordinary. The story revolves around Anne Morgan, a daughter of there financier J.P. Morgan. 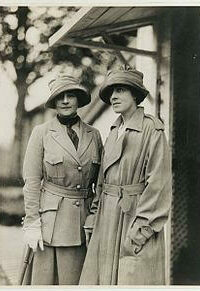 Anne was vacating in Switzerland when war broke out. Confronted by the ruins of Northern France, Anne decided to parlay her not inconsiderable fortune and social clout into forming an American group, staffed entirely by women, that would save lives and help the living. 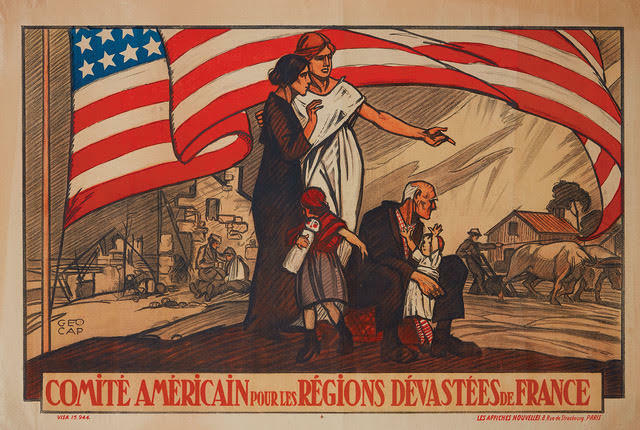 She organized the Comite Americain pour les Regions Devastees de France or CARD in 1918, that functioned more or less like the Red Cross. Ms. Morgan had exacting specifications for volunteers. They must speak French, pay their own way, and have a driver’s listen as CARD had its own ambulances. The committee helped relocate 50,000 homeless, build orphanages, establish clinics and social centers, operating until 1924. The posters reflect the can-do attitude of CARD. Here volunteers are pictured escorting fatherless families away from smoke and into sunlight. 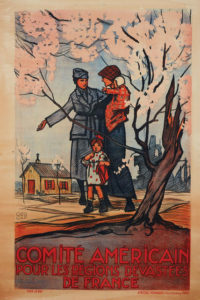 These scarce posters speak to the kindness and heroism of American women in stressful times.